It’s no secret that taking care of animals and supporting our veterans is something near and dear to the hearts of us at Inlanta Mortgage, Inc. In fact, one of our own team members, Milena Grcic, recently helped end a case of animal cruelty with a cat’s rescue in South Milwaukee. That’s why it was no surprise when Inlanta announced its 2018 charity partnership with Pets for Vets, an organization that helps pair rescue dogs with at-risk returning veterans, as part of its 25th anniversary celebration that kicked off in September. Between June – December 2018, Inlanta made a donation for every loan it closed , along with holding various employee fundraisers both in the home office and branch offices, including its annual charity raffle held during its National Conference in September. 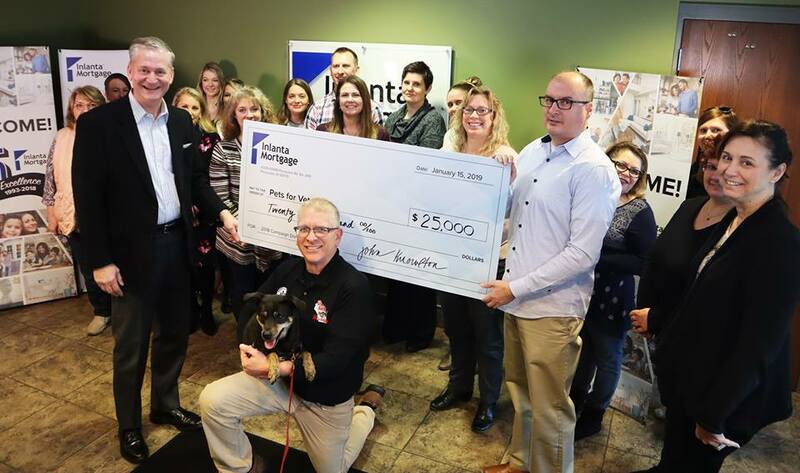 In January, the final campaign proceeds of $25,000 were presented to Dan Zealley, executive director for the Milwaukee, Wis., area chapter of Pets for Vets. Pets for Vets is a 501(c)3 organization that unites military veterans with shelter pets. This program supports veterans who may be experiencing anxiety, depression or stress, while providing a second chance for animals who will be rescued, trained and paired with veterans who could benefit from the companionship. Learn more at https://www.petsforvets.com/milwaukee-wi. This entry was posted in Community Spotlights and tagged pets for vets by Inlanta Marketing. Bookmark the permalink.